There’s a romantic attachment to wood stoves that folks don’t feel for their gas or oil furnaces. The reasons include: Economics, aesthetics, efficiency and environmental concerns. Today, wood stoves offer homeowners the option of a heating system that’s independent of local utilities, plus the lure of cozy evenings cheered by gently flickering flames. If there’s a wood stove in your life (or in your future) and you have a masonry fireplace in your home, it’s likely that you have used (or wish to use) your current fireplace chimney for your wood stove or wood burning fireplace insert. This configuration would seem both sensible and economical; however, heating systems work best when all of its parts are designed to work together. Just as a furnace operates best when the chimney’s flue size is matched to furnace capacity, a wood stove is safest and most efficient when attached to a chimney that’s flue size closely matches the flue collar outlet. (A flue is the inner section of a chimney, designed to carry away smoke and other toxic products of combustion) While wood stoves can be successfully connected to fireplace flues, certain standards must be met. 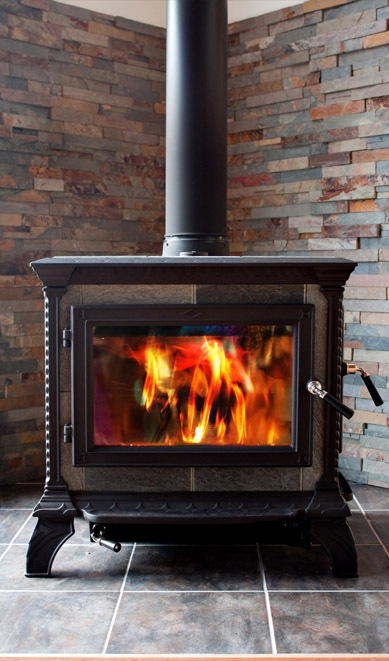 There are two types of wood stoves that can be connected to fireplace flues: Freestanding stoves and fireplace inserts. Freestanding stoves can be connected to chimneys built specifically for them; the chimneys may be masonry or a factory-built metal system, designed, tested and listed for use with wood burning appliances. Freestanding stoves may also connect to an existing fireplace chimney, if the height and position of the flue collar permits it. When this type of installation is done, the stoves may be known as hearth stoves. Fireplace inserts are a special type of wood stove. Inserts are specifically designed to fit into the firebox (where logs normally go) of an existing fireplace and to use the flue to vent smoke and other by-products of combustion. Since the insert must be smaller than the fireplace opening, there is generally a surround panel attached to the stove which extends out around the fireplace opening, sealing the firebox from room air. Since 1984, national codes, standards, and many manufacturer’s installation instructions have dictated that, a connector pipe extends from the flue collar outlet of the stove or insert; exiting up through the fireplace damper and into the first flue tile of the masonry chimney. Fireplaces aren’t designed to vent or carry away the combustion by-products from wood stoves or wood burning inserts; they are a uniquely engineered, solid-fuel burning system. The fireplace system consists of the firebox, a damper (the mechanism that regulates air flowing up the chimney), a smoke chamber (the area between the damper and the flue) and a flue (a passageway inside the chimney through which the smoke rises). Together, they vent the smoke and gasses produced by burning wood. How precise the alignment of the firebox, smoke chamber and flue are to each other, determines the system’s performance. The accepted rule of thumb, included in many local codes, dictates that the area of the firebox opening should be approximately 10 times larger than the area of the flue’s interior volume – a 10:1 ratio. A 10:1 ratio should be used for chimneys less than 25 feet tall and 12:1 ratio for chimneys greater than 25 feet. Whenever a wood stove or insert is vented through a masonry fireplace system, the initial ratios on which that masonry system was based may need to be changed. For example, if the size of an inserts firebox is smaller than that of the masonry firebox, the existing masonry flue may now be proportionately too large. An over-sized flue causes a decrease in the speed at which air moves out of the chimney. This lets the smoke exiting the wood stove linger in the chimney, cool down and deposit condensed creosote on the chimney’s interior. Creosote is a brown or black combustible deposit, occurring when smoke condenses, and it must be monitored and swept out to keep your system safe. Major creosote deposits are created when wood stoves or inserts do not meet the 1984 accepted standard and vent smoke directly into the fireplace or smoke chamber. Smoke condenses inside the firebox and smoke chamber, and may produce a ceramic-hard glaze of condensed creosote which is hazardous, difficult and potentially expensive to remove. Unattended, this eventually damages masonry materials through the corrosive action of acids it contains. It is never advisable to continue the use of an improperly installed stove, even if it is old enough that manufacturer’s instructions did not require the connector pipe to extend into the first flue tile. Insist on a safer installation for you and your family. The “first flue tile” installation method for wood stoves and inserts, vented through masonry fireplaces, solved many problems. For those committed to the use of a wood stove or insert for heat, a more efficient, easier to maintain and ultimately safer method is available. This method calls for the vent pathway to extend from the stove collar all the way to the top of the flue creating a new liner within the chimney. This new chimney liner is sized correctly for the wood stove or insert, so drafting the smoke out of the system is more effective. Additionally, it is an easy and economical way to extend the life of your chimney, as the new liner protects the existing structure from heat deterioration and acid-based smoke condensation. There are three types of tested and listed lining systems available: Stainless steel, poured-in-place, pumped and ceramic. The lining material you select may be determined by the design of wood stove or insert you have and the condition of your chimney. Your chimney specialist will help you decide which system will meet your needs. Pumped liners create a new flue by pumping a special slurry mixture around a form, allowing it to harden and removing the form. Poured-in-place systems use a vibrating “bell” to compress the slurry mixture into place. The mixtures are tested and listed to U.L. standards for chimney liners. They result in a smooth, hard-surfaced flue that runs from the top of the chimney to the smoke chamber and may continue to the damper area. A length of connector pipe then makes the final connection from the new flue to the stove. If you want to use the fireplace in the future, a removable stainless steel liner is the appropriate choice. If modification of the flue is achieved through a more permanent process to accommodate a wood stove or insert, future use of the fireplace may depend on modification. Ceramic liners are installed inside the chimney with a special setting tool, a connector is extended to the wood stove and an insulator is poured around the liner. The liner and insulator together are tested and listed to U.L. standards. An approved wood stove-to-fireplace installation will help insure your safety. Annual inspections and cleaning of these systems by a CSIA Certified Chimney Sweep® will enhance their safety and efficiency. The Chimney Safety Institute of America (CSIA) is a non-profit educational institution that has established the only nationally recognized certification and accreditation program for chimney sweeps in the United States. The program was developed in keeping with CSIA’s commitment to the safety of chimney and venting systems, the elimination of residential chimney fires, carbon monoxide intrusion and other chimney related safety hazards. CSIA devotes its resources to educating the public, chimney service professionals, fire prevention specialists, and the insurance industry about the prevention and correction of chimney venting hazards. *Please note that this material is copyright protected and has been used with permission from the Chimney Safety Institute of America.